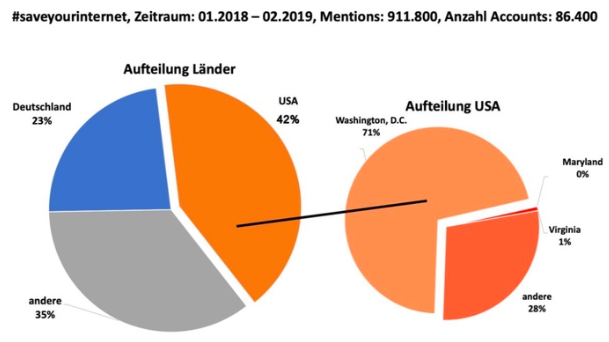 Volker Rieck runs a German anti-piracy operation, and over the last year or so has been an increasingly vocal -- if somewhat unhinged -- supporter of Article 13 and the EU Copyright Directive. I won't link, but a few quick Google searches will find some examples of Rieck trying to build out conspiracy theories of big giant American internet companies secretly running the entirety of the anti-Article 13 push in Europe. You could say that some of them dip into red yarn on a corkboard territory. Of course, as we've discussed before, the idea that any attacks on Article 13 are all really because of Google has been a key part of the pro-Article 13 lobbying strategy from the beginning. Of course, as we've highlighted, if you look at the actual lobbying, it's been almost entirely from legacy copyright organizations, with very little coming from the internet industry. This has created all sorts of conspiracy theories, including the crazy claim by a German MEP that he knew the emails he was getting against Article 13 were really astroturf from Google... because many of the senders had Gmail accounts. Rieck's latest move, however, goes into really nutty territory. In a now deleted story, Rieck claimed to have found something of a smoking gun, proving that Article 13 criticism was really being driven by US corporate interests: in a "study" that he helped "conduct," and resulted in him sending an explosive "warning" letter to Members of the EU Parliament, he claimed to have uncovered that "more tweets (88,000) came from Washington (DC) alone than from the entire EU (71,000)." That would certainly be interesting if it were true. The problem with that claim? It's not even close to true. It is based on Rieck not fully understanding the software they used to do this analysis, called Talkwalker. Luca Hammer initially called into question the use of Talkwalker (while our own Glyn Moody had called out another big problem with the data used in the study months ago). But the biggest issue was this: Talkwalker itself admits that if users haven't turned on location tracking on Twitter, then it just "guesses" their location based on a few factors -- with a fallback being language. And, if there are no other indicators of location, Talkwalker will associate all English tweets with being in Washington DC, i.e., the capital of the largest country where English is the primary language. In other words, what looks like a grand conspiracy of a bot sending tweets about EU copyright policy out of the lobbying den of Washington DC, actually appears to be some pro-copyright maximalists completely misunderstanding the tool they were using to do an analysis. Not a good look. Of course, some of the supporters of Article 13, like IMPALA Music have continued tweeting this "study" despite it being totally debunked, but I guess that's to be expected. In the meantime, as law professor Annemarie Bridy correctly points out, even if this is about legislation for the EU, it's crazy to think that people in the US have no stake in the outcome. First off, EU legislation can reach well beyond the borders of the EU and into the US: witness GDPR and the Right to be Forgotten (remember, in France, they've been arguing that the RTBF, as applied in the EU, must be global in nature). Second, as we've seen for decades, copyright maximalists push ever more crazy copyright policies in one region of the world, and then demand "harmonization" elsewhere, pushing that the same rules be applied in other places. Going to Europe to get a crazy copyright law put in place, and then rushing back to the US to demand matching laws is not a new idea. It's literally how we got the DMCA in the first place. So, no, the criticism of Article 13 is not being driven by some sneaky campaign out of Washington DC, but that also doesn't mean that American voices shouldn't be able to participate in a debate that will undoubtedly impact us and the internet we use. Ignore actual protests and opposition, dismissing them as nothing more than 'bots'. Freak out over phantom/misattributed protests and opposition, spinning wild conspiracy theories based upon at best a gross misunderstanding of the tech involved. Watching them flail about like headless chickens, jumping at imaginary shadows and ignoring the real people would almost be funny if it didn't stand to do some serious damage. Can't say I'm surprised. Every cause has a vocal minority of supporters whose defense of the cause in question involves grand conspiracies perpetrated by some group which, in order to accomplish any of the claims must be organized to the point of a hive mind and not rarely involve apparent superpowers capable of twisting time and space. But the copyright cult shares the extreme end of this in a bunker mentality shared with religious fanatics and sects where EVERYONE speaking out adheres to the warped caricature of reality put forth as a party line. It should be a warning sign to every sane person on the planet that every copyright defender runs the same style of propaganda as the old soviet union, some crackpot supremacist groups and catholic priests from the 13th century. The reason as to why this is the case is pretty obvious, though. Same as with soviet-style communism and orthodox religious doctrine copyright simply isn't defensible using common logic and empirical fact. That serious damage you're describing? We'll have more of that until we finally cave and admit Queen Anne was an inept douche to begin with and it's time to scrap the monster her little censorship tool grew into. Time to exercise our right to forget France, then, and cut it off from the rest of the Internet. If every American company blocked them unconditionally, how long would it take for them to grow up and start playing by civilized rules? My opinion of the internet being given the status of a new country, is still worth thinking about. With every other nation trying to get the Net to BE' something it isnt, is as bad as Moither/father fighting each other over The childrent.. The problem is that there are 200+ Mothers and fathers..
A couple countries are TRYING to Close in/out access to their sections of the net. "This is My child and I will Do with him as I please", isnt getting people very far..
this is for all the persons we hire to assist the common man.. HE DONT KNOW certain things, and should not talk about them unless he knows more.. better to not say things, then Open mouth and show you know nothing. So we Hire persons WE THINK, are supposed to know and understand things, or will take the time to LEARN about things they Need to know.. Its a PAID JOB. This is like getting little bill to come over and adjust your TV, because you dont know how... Or to fix this stupid new smart phone..
WE hope someone will help us with all the BS flying around us. So, what happens when the common man can see nad hear and Know, something BETTER then the idiot they/we hired??? How many mistakes does little billy make, before we call over little sally?? A person asks me how my day is, and I say, "New cow, same pile", (they love it).. HOW MUCH BS are we wading thru?? yes all of us. for electing persons that seem to never had any experience, knowledge, Common sense..
Where is the truth, justice, NO FAKE NEWS, that all of them are screaming about.. when we cant even trust the idiots to ASK questions.. I actually had the misfortune of interacting with this Volker Rieck fella on Twitter. He tricked me into giving out the URL's of one of my favorite forum websites, and when I expressed anxiety, after having found out about his anti-piracy site, he told me that I should stop taking drugs and that I ought to see a doctor. What a chud! How many anti-Article 13 posts in today's tantrum on this site? For someone with no direct stake in it for now, Mike sure has a one-track mind. A better question is how many tantrums are you planning on throwing in the forum today? Cool story bro Article 13 will pass. Tantrum 1 in process! Stay tuned for Tantrumwatch, let's see how quickly the meltdown commences! Oh he’s well into his third one today alone. So you got nothin’m. Not suprising from Lyin Whinin Jhon Smith. "Cool story bro Article 13 will pass." A disaster for legal business and independent artists. No problem at all for pirates who already aren't in the venue getting hit by article 13. And in this it's no different than any of the similar lunacies which were launched to shut the door on previous legitimate uses on newly invented media types. The only unknown here is how you'll react when copyright holders start screaming in outrage and terror after article 13 starts doing what they actually asked it to do. As part of the pirate crowd I'm actually not much concerned with Article 13. Cool story? Yep, especially the ending where you people stand around screaming about how that wasn't what you wanted. This pirate agrees with you, albeit for a different reason than you do. The other guys on this forum? Outraged, mainly because same as me they see what article 13 will do but they still have a few f*cks to give about what happens to the crowd of actual rightsholders that'll lose all online visibility. I lost all sympathy with said rightsholders when they let themselves be represented by copyright trolls and control-freak politicians. And how many times will everyone be called "toddlers?" He only called people that because someone else called him it first. Same with tantrum. Ol John boy can’t even come up with an original insult. Every coffeehouse has someone who will greet you on your first visit, act like they know everyone, tell you their opinions of them, etc., in an attempt to get you to side with them in disputes. They are the ones who try to "educate" you about "how things work" as if their status is somehow implied. The cool people in coffeehouses are the ones who stop in while living their lives )*(as opposed to making the coffeehouse their social life) and don't know a thing about the internal politics among the "regulars." Re: Would you like another helping of contemt? "Ol John boy can’t even come up with an original insult." John/bobmail/Baghdad bob is fanatic in his belief in copyright. It's somehow revealing that the firmest adherents in copyright couldn't get creative to save their lives. Ironically all they can do is copy. Even in the way they try to insult others. "In the meantime, as law professor Annemarie Bridy correctly points out, even if this is about legislation for the EU, it's crazy to think that people in the US have no stake in the outcome. First off, EU legislation can reach well beyond the borders of the EU and into the US: witness GDPR and the Right to be Forgotten (remember, in France, they've been arguing that the RTBF, as applied in the EU, must be global in nature). Second, as we've seen for decades, copyright maximalists push ever more crazy copyright policies in one region of the world, and then demand "harmonization" elsewhere, pushing that the same rules be applied in other places. Going to Europe to get a crazy copyright law put in place, and then rushing back to the US to demand matching laws is not a new idea. It's literally how we got the DMCA in the first place." Without the DMCA, websites and intermediaries would be sued directly. So replace it with a Section 230 system instead. But, they're directly repealing the European equivalent. Which is an ability that article 13 will establish. It makes the site responsible for user postings. But, it's not possible to do that. Sooner or later, you'll slip and then it's a lawsuit. Exactly. The goal is to turn the entire internet into a passive broadcast medium like Netflix or Spotify. "Without the DMCA, websites and intermediaries would be sued directly." The DMCA in itself is the legal framework which allows for easy lawsuits to be levied on 3rd parties. before that it was a freedom of speech issue which demanded a higher bar on evidence before a lawsuit could succeed. In practice, "safe harbor" in the DMCA is what allows anyone to publish anything online. It's somehow classic that DMCA apologists keep raising the flawed argument that "If not for the DMCA everyone would be sued under the legal paradigm mandated by the DMCA". circular logic isn't a good argument. Neither is an outright lie. Mike sure has a one-track mind. This is the least self-aware Techdirt comment since that time Richard Bennett said net neutrality was a quaint fixation. I'd be interested to see someone run this software again, focusing only on complaints in Portugese. Presumably it'd "prove" that Brazil is "trying to influence the process"? Or perhaps try to get the devs for this software to point the default locations to uninhabited areas, thus proving that no one is trying to influence the process. That venerable institution which in Germany was one of the few government organizations to survive almost untouched from the third reich where it's task was to guard "cultural purity" and whose boss, famed for giving out copies of "Mein Kampf" to his subordinates was still sitting comfortably until well after WW2 was over? Not surprised at all they come out swinging in favor of article 13. ...and before anyone Godwins that I have to point out that calling a genuine nazi relic a nazi relic probably doesn't fall under that rule of rhetoric. Godwin's law tends to get misused, anyway. All the "law" really states is that there is a strong tendency for a comparison to Hitler or Nazis to crop up in any long-running internet discussion. It doesn't purport to codify a logical fallacy, or even make a determination on whether or not said comparison would not be apt. The wikipedia article on it points this out rather effectively, including statements from the dude who originated it. Godwin's law does not claim to articulate a fallacy; it is instead framed as a memetic tool to reduce the incidence of inappropriate hyperbolic comparisons. "Although deliberately framed as if it were a law of nature or of mathematics," Godwin wrote, "its purpose has always been rhetorical and pedagogical: I wanted folks who glibly compared someone else to Hitler to think a bit harder about the Holocaust." In December 2015, Godwin commented on the Nazi and fascist comparisons being made by several articles about Republican presidential candidate Donald Trump, saying: "If you're thoughtful about it and show some real awareness of history, go ahead and refer to Hitler when you talk about Trump, or any other politician." In August 2017, Godwin made similar remarks on social networking websites Facebook and Twitter with respect to the two previous days' Unite the Right rally in Charlottesville, Virginia, endorsing and encouraging efforts to compare its alt-right organizers to Nazis. In October 2018, Godwin said on Twitter that it is acceptable to call Brazilian politician Jair Bolsonaro a "Nazi." If the comparison is actually apt, compare away.